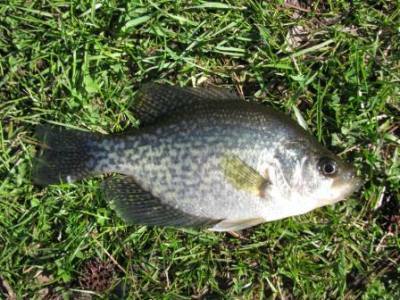 The black crappie is a deep bodied, uniquely colored member of the sunfish family. The species can be distinguished from white crappie by its seven or eight dorsal spines, darker coloration and heavier body. Black Crappie are known as sac-a-lait in parts of Louisiana. In Florida and other southern states, the black crappie is known as calico bass, speckled perch, or speck. Lake Okeechobee is said to be the speckled perch capital of the world due to its abundance of black crappie. Black crappie are caught using artificial lures as well as live bait. They are especially fond of live minnows which are among the most common baits used by anglers. Crappie also respond to small jigs, spinnerbaits, crankbaits and fly patterns.